One thing we’re big on here is data analytics,” said Eric Dill, senior vice president, human resources, at American Arbitration Association (AAA). Just don’t call it “Moneyball” for nonprofits. AAA has added predictive analytics to its recruitment and hiring process, using Berke Assessment, a web-based tool for final candidates to assess their cognitive and personal traits, mapped to the job role. “We don’t rely on it totally… but to identify high-potential employees,” Dill said. “We know who the high performers are, but it’s also a tool to say, maybe you didn’t consider this employee for this role,” he said. All employees receive performance reviews but in some recent cases analytics have enabled AAA to identify current employees for promotional opportunity who might not have otherwise been obvious for consideration. “It gave us different insight,” Dill said. He pointed to one candidate who was recently promoted. Their skills and natural ability correlated well to a promotion but if interviewed, they might come off as quiet or reticent. “Sometimes they don’t interview well but otherwise they’re quite strong,” Dill said. Data analytics help with both recruitment as well as retention, a primary focus for AAA. While AAA participated in the Best Nonprofits survey for the first time, other organizations returned to the list after a few years off, including this year’s topranked nonprofit, NOWCC, Inc. The National Older Worker Career Center (NOWCC) also earned the No. 1 ranking when it last participated, in 2014 and 2015. Someone at another association was reading the April 2014 issue of The NonProfit Times, saw that NOWCC was among the Best Nonprofits and started applying for jobs there, according to German “Cito” Vanegas, president and CEO. “We didn’t have anything that matched her skills set” at the time, Vanegas said, but she ended up joining the Arlington, Va.-based organization by 2016. 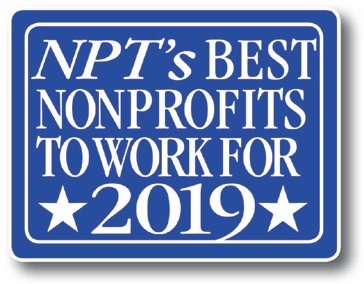 The 2019 Best Nonprofits to Work For report was dominated by small organizations (15 to 49 employees) and medium nonprofits (50 to 249 employees). 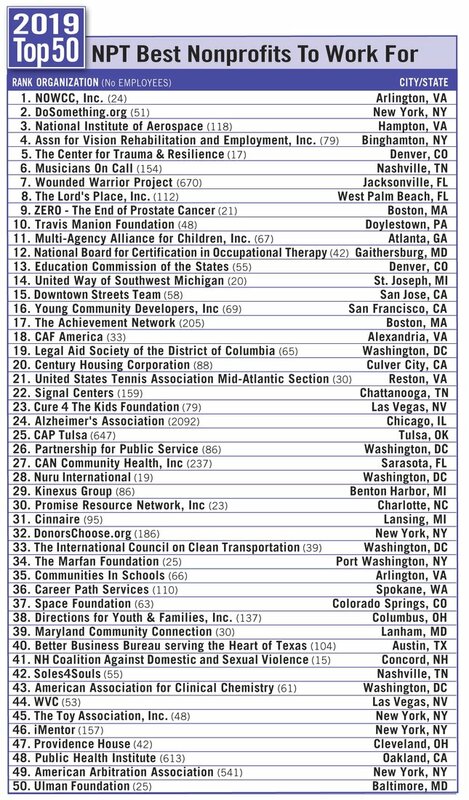 Eighteen small organizations made the top 50, including No. 1 overall and five of the top 10. Medium organizations accounted for more than half of the list, at 27, including 11 of the top 20. Many organizations use the survey data to gauge their own operations and garner employee feedback. Both previous times that Public Health Institute (PHI) participated in the Best Nonprofits To Work For, human resources staff used the results to make recommendations about new programs or initiatives, according to Valerie McCann Woodson, vice president of human resources. “When we started this process, it was not with the idea that we’d win but that we’d learn about our organization and how we can continue to improve,” she said. “We are a continuous learning organization — research is in our backbone — we follow through on that,” she said. “We identified some metrics for ourselves to monitor on a regular basis: where are we, are we improving in certain areas,” said Mary Pittman, chief executive officer (CEO) of Oakland, Calif based PHI, which ranked No. 48 overall and fourth among large organizations. “The voice of employees is important to us, where we want to improve upon, or even what we would like to offer them as a benefit or ways they can be more effective in their work,” she said. PHI has monthly meetings to monitor its survey and progress. After one survey Pittman said staff wanted more professional development opportunities so PHI launched a new management training certificate program. 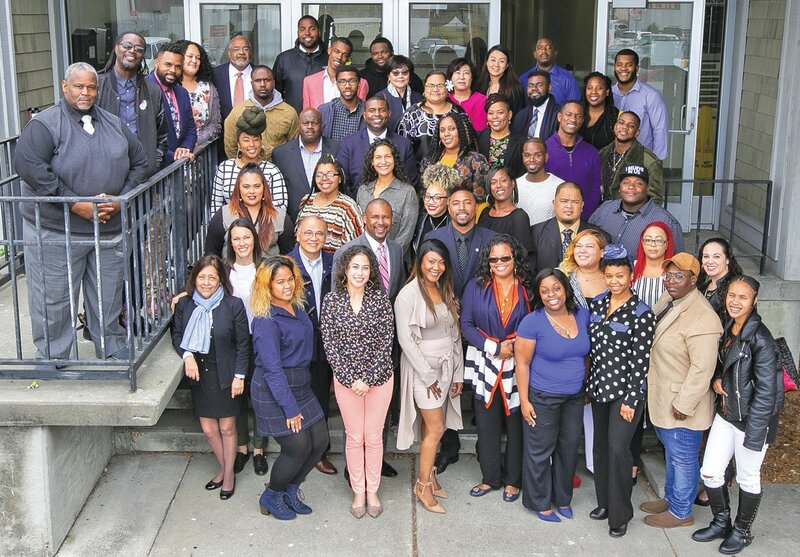 Since 2017, more than 80 employees have participated, including nearly 20 who have earned the certificate. The No. 1 organization, NOWCC, works to get all employees certified in their position through outside education. There’s a strategic work plan with clear expectations, Vanegas said, with progress for all staff and courses are paid 100 percent by NOWCC. “Feedback from the survey gives us things to work on. It’s not just to get an award,” Pittman said. “We’re doing it because we believe if we take care of our employees first, it allows us to do our work, and to be a great place to work,” she said. PHI has always had strong benefits and employees appreciate that, Woodson said, but some tweaks came out of the survey results as they continue to improve communications and make these offerings around professional development. “As a public health, health-driven organization, we do everything we can to try to help our employees stay healthy and focus on prevention and wellness,” Pittman said. PHI covers 100 percent of employee premiums for medical and dental insurance but Pittman stressed it goes beyond medical care. That’s why it’s called Wellness360. The organization invested $500 in wellness rooms at each of its four major offices. Employees wanted to have a place to go where they can take a moment for themselves. The room includes a sofa, artwork, yoga mat, refrigerator and fountain. There’s also a stress reducer kit, which includes such things as sketch books or a stress ball that employees can bring back to their desk. Since sitting is considered the new smoking when it comes to heart disease, workplaces have jumped on the trend of standing desks for employees. AAA piloted a standing desk program almost two years ago before implementing it last year. “It’s gone over well,” Dill said, admitting that he was skeptical at first because of some “low cubicle environments” that might disrupt workplace neighbors. “If anything, it’s helped to create an even greater sense of community,” he said. “The issue we have is if we can get our hands on one. It’s an item that has to be budgeted,” Dill said. In addition to physical well-being of employees, Best Nonprofits educate staff to keep financial well-being top of mind. “We believe that having good benefits and a strong salary is important but also supporting people in their financial literacy and well-being,” Pittman said. PHI has implemented a three-part retirement education series around financial wellness and free financial counseling. “People who are near retirement and those not close but curious have taken advantage,” she said. Pittman said the real proof is that PHI provides 10 percent of an employee’s salary toward a 403(b) retirement plan as a standard benefit for all employees, who become eligible after six months with the organization. There is no vesting requirement nor a requirement for employees to contribute but through education and communications, PHI encourages contributions. That’s paid off as 74 percent of eligible employees make voluntary contributions to their plans, according to Woodson. Staff members have contributed $17.7 million while PHI has contributed $22.3 million during the past five years. “We see that as a way to get people to take advantage of their generous benefits and leverage for the future,” Pittman said. PHI sponsored a three-part seminar series last summer, “Transition to Retirement,” and offers access to its 403(b) administrator and account executive at all locations several times a year, and by appointment. For a nonprofit, finances can fluctuate based on the economy, philanthropy or government contracts, Pittman said, but PHI has established those offerings as a priority. “What we have to do is put that as a baseline. The times would have to get really hard to cut those,” she said. “Employees are our number one asset, we wouldn’t able to do the work we do without incredible staff. We want to make sure we’re taking care of them as best we can,” Pittman said. Financial education workshops, seminars or classes were a difference-maker among large nonprofits. Every large organization that made the Best Nonprofits list offered such programs compared with only 71 percent of large organizations that did not make the list. Overall, the percentage of nonprofits offering the programs was more even, about 55 percent, and also closer among other size categories. Human resources was a “major priority” of India Johnson when she became CEO at AAA in 2013, according to Dill. A lot of organizational behaviors and initiatives were modeled around various best places to work studies, he said. AAA made a big push around its retirement plan starting in 2017. The organization had a voluntary participation rate of less than 50 percent in its retirement plan in 2016. Senior leadership and the board identified that as an area for improvement. After a concerted effort, AAA was able to boost that to 89 percent. There were periodic reminders to staff and even targeted mailings to individuals’ homes where perhaps a spouse or family member might see it. “Sometimes there’s a lot of noise at work, maybe we’d get their attention outside of work, that’s helpful,” Dill said. The average voluntary contribution by an employee was less than 4 percent but has since increased to 6.5 percent, he said. The employer match has grown too, increasing just this year. AAA would match at 4 percent if an employee contributed 5 percent; now if an employee contributes 6 percent, it will be matched at 5 percent. AAA also started making discretionary contributions of 3 to 4 percent a few years ago. It’s a commitment by the nonprofit to enhance retirement savings for staff, Dill said. The employer match vests immediately while the discretionary match has a six-year vesting schedule. Combined, the retirement plan has the potential for an employee to attain a 15-percent growth rate. “We‘ve gotten people to pay attention to what their future is,” he said. Leadership and Planning was even more pronounced among small organizations, where Best Nonprofits scored 93 percent to 78 percent of those that did not make the list. 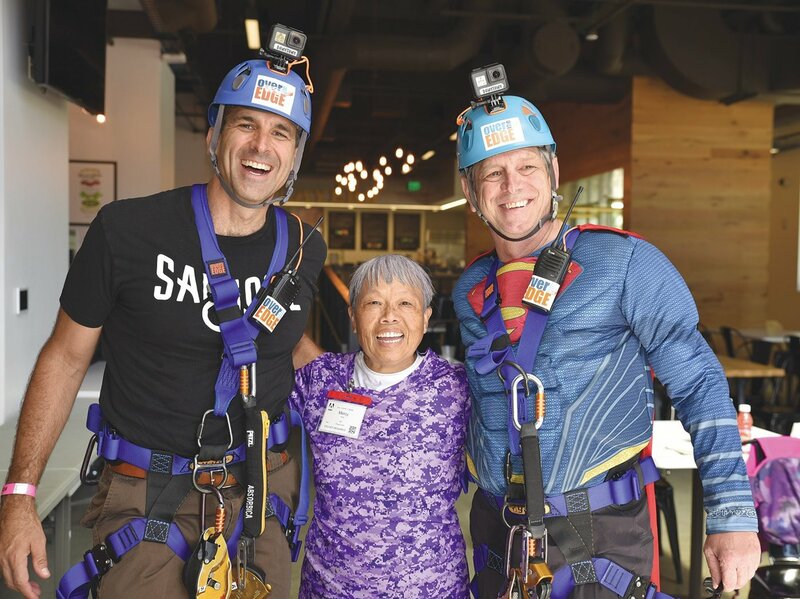 The category of Overall Engagement saw the highest percentage for Best Nonprofits, at 92 percent, compared with 86 percent for those not ranked. Best Nonprofits rarely scored less than 80 percent on any one of the 79 questions. “I understand the importance of my role in this organization” — 95 percent. The biggest disparity within the survey, between those selected as Best Nonprofits and those that did not make the list, was on the statement, “Staffing levels are adequate to provide quality products/services.” Overall, the 50 Best Nonprofits scored an average 80 percent positive response while employers not on the list scored only 58 percent — a difference of 22 percentage points. It was the lowest score overall for nonprofits not on the list, and significantly less than the average 76 percent within the category, culture and communications. The imbalance was pervasive across all sizes of organizations when it came to adequate staffing levels. At small organizations, 82 percent of Best Nonprofits had a positive response, compared with just 59 percent at other organizations. Among medium organizations, Best Nonprofits, had 81 percent positive responses versus 63 percent at other organizations. “My pay is fair for the work I perform,” scored 79 percent — the lowest individual question for Best Nonprofits, but still 16 percentage points greater than 63 percent scored by those not on the list. That was the second-largest gap among positive responses. AAA determined through an annual benefits analysis that only about 40 percent of staff, including members of their household, were getting their annual physical. Its Healthy Directions program provides a $10 per month discount on employee portion of healthcare fees, which could cost the organization upward of $60,000 annually. To encourage staff to see their doctors regularly, AAA introduced a quarterly raffle for a $1,000 gift card for employees who get their annual physical. About 83 percent of staff now get their annual physical. The idea is that frequent and regular communication between doctor and patient improves the chances of catching a manageable disease or other issues at early stages, Dill said. “The cost of someone having a heart attack because they didn’t treat hypertension, that’s significant compared to several hundred dollars per month on blood pressure medicine,” he said. Finding a manageable disease sooner, before it becomes catastrophic, will be much less expensive. “What motivated us to do it was we looked at data where we were spending on healthcare,” Dill said. Common diseases like hypertension and pre-diabetes were not showing up as common among employees but after digging down into the data, AAA found that people were not getting their physicals. “Employees get engaged, interested and involved. The raffle is a great way to do it,” Dill said. These different benefits programs are a cost to the organization but it’s part of AAA’s recruitment and retention efforts to keep other costs in check. People sometimes overlook the true cost of turnover, which is something to consider in the current low unemployment environment. “We look at a lot of data analytics across a range of human resources practice areas but one of our biggest drivers is recruitment and retention,” Dill said. AAA has a turnover rate of about 11 percent, and would like to keep it there or lower it if possible. “There’s a significant cost to turnover. While these programs and benefits can add up, the benefit is in having a lower turnover rate and creating a much more efficient organization,” he said. Based on average salaries and average turnover, the difference between a turnover rate of 11 percent and 15 percent could mean a savings of a half-million dollars or more — and that’s being conservative. “When human resources introduces that topic into the conversation, it validates why it’s important to spend a little money here or there,” Dill said. I have confi dence in the leadership of this organization. Overall, I’m satisfi ed with this organization’s benefi ts package.